requests, please email back if you'd like more info and if you'd like to chat we can arrange a skype call. The photo shows how the team here has grown recently. 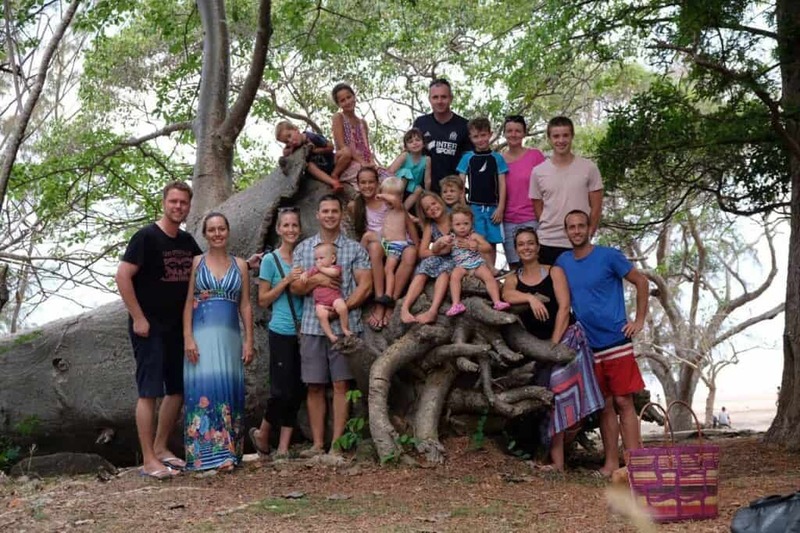 We now have a Brazilian couple living near us in Mamoudzou, an American couple living a short drive away on the west coast and a Canadian short-termer who's with Chris and Sarah. The Americans have set up a gym and are making a great number of contacts. Please pray for them as they need people to come and work with them ASAP. 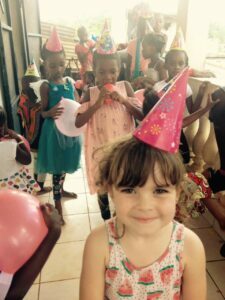 Maybe you would like to come to Mayotte for a while and do ministry with them (and us)? Or maybe you know a friend who would want to? 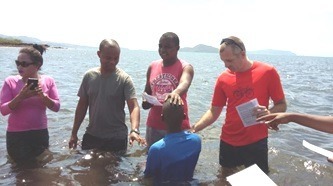 It is really encouraging to have gospel partners arriving on Mayotte. I've actually just had lunch with a Malagasy/French man who has come to Mayotte as an evangelist and is working with Campus for Christ. We were sharing resources and project ideas. It's great that Christians in France seem to be considering moving to Mayotte - although not yet enough! Sadly, however, we'll soon be saying goodbye to Chris and Sarah (and their kids) as they are moving on to a new role within AIM in the summer. Pray for them to as they move on and for us as we take over responsibility for some of the things they have been doing. Please pray for us a team that we would continue to get on well and support each other in a difficult ministry location. They really are a great bunch - and photogenic as well! Mayotte continues to be a hard place to do evangelism and discipleship. Pray for us to always be ready to speak about Christ and to make the most of every opportunity. Pray for the young believers we've mentioned in previous emails and pray for us as workers here as we plan for how best to disciple and gather the few local Christians into groups. This prayer request doesn't go with the picture, sorry. Our aim in coming to Mayotte was to do church planting among the Mahorais in partnership with the international church. Unfortunately it seems like we are going to have to step away from the role with the church. This is a great source of sadness to us, but it is clear that at present we cannot work with the leadership of the church as gospel partners. Please pray for our Dad to intervene and change hearts. And please pray for us to love Christians and to know what to say to each one. Pray too for certain members of our home-group who seem to be grasping the gospel for the first time as they study the Bible with us (including a Hindu Nepalese woman - I know! That's not why we came to Mayotte!). Pray that we would be able to find a way for them to continue to get Bible input and be in community with other believers. Just a quick note to say that we are currently figuring out Home Assignment plans for this year and we'll let you know soon our planned movements over the summer months. As always thanks for your prayers, financial support, and precious partnership in gospel ministry. It's cruise ship season in Mayotte! Not many, but a few ships have started arriving the past few years and they are always full of the English! The other day we were relaxing on our day off at the beach and just next to us a Mancunian grandma was skyping her kids and grandkids, "Yeah we're in Meyotti now...yeah best holiday ever...it's like paradise here!" I nearly spat out my freshly squeezed topical fruit juice on to the soft white sand! Paradise?!? Try living here love! Just a few days later we watched the images on TV of Paradise in California literally burn to the ground! We can't find or build paradise here on Earth hey? It's interesting though how a comment like that makes you lift your head and try and see Mayotte through that woman's eyes. The beach we were at is absolutely beautiful. Mayotte is a naturally spectacular place. It's as pretty as anywhere I've ever been. But of course it's only on holiday that we describe somewhere as being like paradise because we are not there long enough to see the ways the Fall and human sin affect everything. That woman on her cruise needs to hear the gospel message as much as the people here do! Mayotte at the moment is not Paradise but it is largely calm. It seems like the new Prefect is quietly getting things done. The weather is heating up and the humidity is extreme and very tiring. Praise God for this photo! During the study (on Jesus saying "My God why have you forsaken me?" on the Cross) I suddenly took a mental and literal step back and looked at that scene and thought, wow this is pretty cool! Pray for the Christians in this group who don't yet have a really solid grasp of the gospel. Pray too for a Nepalese woman who one of the church members has started to bring along. She is a Hindu and very open to the gospel. Amazing that we get to witness to a Hindu Nepalese woman! Pray too for the two young men from the island next door to ours. One is a professing Christian the other is his friend who is very open. Both are from Muslim backgrounds and a decision for Christ will cost them a lot. Please continue to pray for the ex-pat church we are serving. We are still looking for a pastor. One is coming for a trial period soon, so pray for discernment. Pray too for our various activities (preaching regularly; leading a home group; both Alma and I are doing Sunday school; and our monthly Evangelism training group). Pray that we will be able to preach the gospel whenever we get a chance. Please pray for Alma at her work. She is working part-time teaching English. 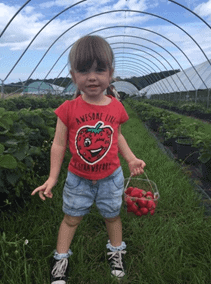 This has been a great boost to her French language learning and has led to her meeting lots of people from different backgrounds. It is also pretty tiring sometimes. Pray for her witness. You can pray too for our wider team: the Powers in Chiconi; Andrew a short-termer with the Powers; the Brazilians (Breno, Raphaela and little Manu) in Mamoudzou; and the Americans in Tsigoni who are not with AIM but who share a similar vision. It's great to have a group who think very similarly about gospel ministry but who have such different backgrounds and such different skill sets and interests. Pray for us as we seek to care for one other and encourage one another. 1. Alma recently accepted a job working for an adult education centre based in our village. This is great and a real answer to prayer. She's starting on the 1st of June part time. She will be teaching English to adults. Pray she will do a good job and God will put local people in her path who are ready to learn about Christ as well as learn English! 2. Our role with the church is developing. I am now on the council of the church and have attended a few meetings - getting my feet under the table! This weekend the church put on an event where clothes were distributed to those in need. Pray for those who received this practical act of Christian love and for those who heard the gospel. Last weekend the church hosted a church planting training event and yesterday we had a group of 10 people at our house to discuss the training and what to do next. There were some very exciting ideas shared and we hope to start training people soon using a church planting manual which we as a team have been writing this past year. 3. Although our Sunday group has stopped meeting and certain members seem to have wandered away from Christ, Adam and Sharif are doing well and growing in their faith. Adam was at the meeting mentioned above, pray for him as we look for how to use his teaching gifts and his knowledge of I$1am to bless the church and bring the gospel to his community. 4. You'll be excited to hear I've restarted my football career! More of veterans team these days. Pray for gospel opportunities as I play and train. 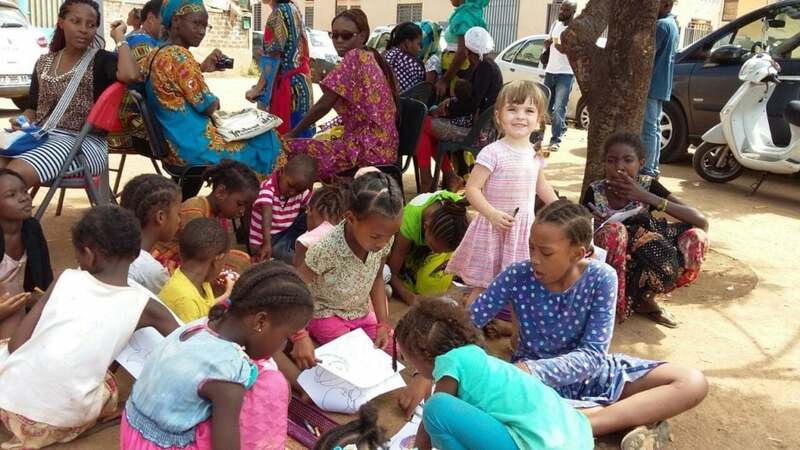 Anya playing with some local children during a church event giving out clothing. We will be on a short home assignment in England and Ireland in July and August. Sunday 15th June: We will be speaking at Christ Church Leyton, having a BBQ afterwards and then watching the World Cup final somewhere! Christchurch Leyton, 10:30 AM, 73 Francis Road, E10 6PL - we'd love to see you there! Monday 16th to Thursday 19th July: AIM Home Assignment Conference, Swannick. We will be in Ireland from the 2nd to the 16th of August, so you will find us at Donegal Town Presbyterian Church on the Sundays of the 5th and the 12th August. We will also be helping out with some of the Holiday Bible Club. Looking forward to it already! Thanks for reading and praying. Yesterday we baptised Moses*. We shared with you about his story last year. He comes from Madagascar and grew up in a Muslim family, so to be baptised is a big step. It was a great day. Praise God for him and pray for him, we are aware that the time after baptism is often difficult spiritually. Like I said, we had a great Summer away from Mayotte. We spent 2 weeks in Kenya doing Church Planting training, then a couple of weeks in both Ireland and England catching up with a lot of you, followed by a holiday camping in Norfolk with family. 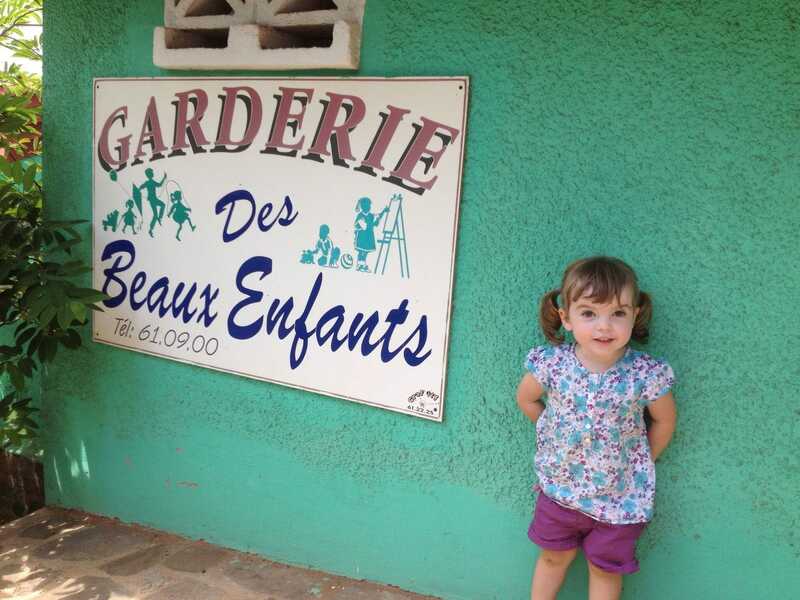 Anya especially had a great summer, and misses her Irish and English cousins back here in Mayotte. A big thank you to everyone who met with us, helped us and encouraged us during the summer. So, if you pray for us, praise God for all of that, pray for Anya as she settles back in here, and pray that we will know how to put the training we received over the Summer into practice. Now we are back, everyone is talking about 'La Rentrée' - the time of year when people get back from their holidays and get back to work or school. Anya is starting school this week. She will be starting the equivalent of Nursery School and will go from 7-12 Monday to Friday. Alma has got a short term contract teaching some English at the University. This is a bit of an unknown at the moment but could be a great foot-in-the-door into the student world here. We will be starting up our little group on Sunday afternoons. We are going to put into practice what we learned during our training over the summer and so will be focusing a lot on accountability and on evangelism. We are launching a Men's Group at the church in September. I will be leading it alongside a deacon at the church and am very, very excited to get it started. This might be a bit of a surprise but I (John) have been accepted onto a post-graduate 'Bachelor of Theology Honours' degree (IN FRENCH!!!) with South Africa Theological Seminary. This means that probably two mornings a week I will be studying theology. The aim is to get further training in order to be of more use to the church both now and in the future, and also to improve my French. There is a cost involved, just under £1000 per year for three years. Especially pray for us as we attempt to be bolder and more regular in getting out and sharing the gospel with those around us - both those we know and those we don't yet know. As many of you are aware, on February 4th at about 2am I awoke to the sound of men inside our house. When I woke up John, the robbers fled taking a bunch of our stuff but leaving us completely unharmed - Anya slept through the whole thing. They'd sliced through our door lock silently and had managed to take phones, a tablet, my handbag and a speaker. My handbag was found the next day by someone who returned it to me with everything still inside - except two apples and a nappy. The day after the break-in I couldn't stop thinking of the verse in Psalm 62 'He is my fortress, I shall never be shaken'. We seem to say and sing this a lot in church back home and I've always just thought about some sort of big Irish castle which is hard to translate into my day to day life. But that day I had a clearer picture - HE is my fortress - as I tried to stop myself from thinking about the what if's.. I had a very clear understanding that God had protected us, no matter what type of building, country, situation you live in, God is the One who protects. God's timing is amazing and five days later we were on a plane to Kenya for training and a holiday with John's parents. It brought such refreshment to leave our house for a bit and enjoy time with other workers and our family. The distance and time have meant we have come back feeling at peace about our home and feeling excited about the coming months on the island. 1. Give thanks for God's protection. 2. For our neighbours - they have been amazing, the night of the break-in everyone got up to help us, one offered the loan of his dog to help us sleep, another gave us a replacement lock for our door - which our landlord has since reinforced. Please pray for opportunities to share with them the hope we have in Christ. Finally a big thank you for the prayers and support we have received over the last month. Our home churches have been wonderful. Gifts have been sent and replacements for our stuff were quickly gathered from home and given to John's parents to bring out to us in Kenya. Amazing. AIM have also been so caring and supportive. We feel so humbled and blessed by so many of you taking time to write, text, pray and think of us, thank you. It seems like a long time since we wrote a Prayer Letter and a lot has happened in the meantime. Here is our news and prayer requests. In November I was able to sit with two men, explain the gospel to them, call them to commit to follow Jesus and then lead them into a new life with Christ as they confessed sin and said they wanted to follow Jesus from then on. You can read below a bit more about these two guys. What they both have in common is that they have had years of Christian influence in different countries, and I was the one who was here at the end of all the good build up play by previous Christians to score the tap in - stick the ball in the back of the net (sorry for the football metaphor - it's a struggle to not use more of them). This is obviously a massive answer to prayer and this is why we are here, so please praise God for what he did in those two young men's lives. Opposite you can see a picture of me preaching my first sermon at the church here. It was actually the first time I have ever preached a full length sermon in French and the preparation time was immense, but it went well and was great to be given that opportunity by Pastor Faly. Alma is getting involved in the women's group here; we are starting to attend home group and we are thinking about how we can best serve the church over the coming years. Praise God for good relationship with Pastor Faly and a good start to getting to know the church. 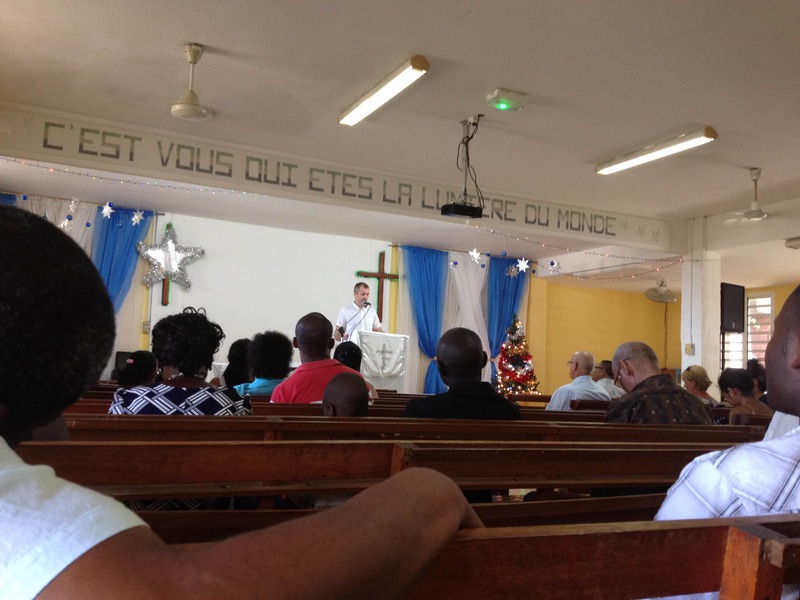 John's first sermon in French! 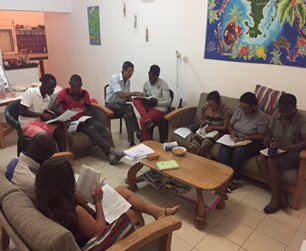 The third big focus of our work here (in this first year on Mayotte) is language learning. We are continuing to work on our French daily (it remains hard work). We have been able to speak a bit of ShiBushi with old friends in Chiconi and we are planning on getting going with basic SiMaore this year. Alma has already been going to a Shimaore class and enjoying it. We straddle a few worlds here at the moment (as shown in the pictures below) and in a ideal world we would be fluent in multiple languages (French, Malagasy, ShiBushi, ShiMaore and more). Obviously that isn't really possible, so please pray for motivation, energy and wisdom in working out where and how to focus our efforts in language learning in 2017. From around about the time that Adam gave his life to Christ I have been hit by a few illnesses and feel like maybe only now I am recovering. Alma is as strong as an Ox (she's not an overly pampered suburban cry-baby like me) but she too has been tired at times over the past few weeks. What this means is that the past month and a half we have had to slow right down and take a lot of time off. Please pray that we will fully recover and have better levels of health and energy in the coming weeks.